HAMPTON, GA. ? Jimmie Johnson usually smokes his tires to celebrate a victory. Not this time. Instead, he drove back to the finish line to pick up the checkered flag. Johnson became the first driver since 1998 to win three straight races in a season, holding off Mark Martin on Sunday for a poignant victory at Atlanta Motor Speedway. Last week, Johnson did a burnout after winning at Martinsville, but he never made it to Victory Lane. A plane carrying 10 people — many of the key members of Hendrick Motorsports — had crashed on its way to the race. Johnson didn’t learn of the crash until afterward. The celebration was called off, replaced by mourning. When Johnson got to Atlanta, he couldn’t think of a better way to honor the victims than by winning the Bass Pro Shops MBNA 500. But he had to beat Martin, who clearly had the strongest car on the track. Martin led 227 of the 325 laps, while Johnson was out front for only 17. But he led the one that counted, comfortably beating Martin to the line by 0.293 seconds. 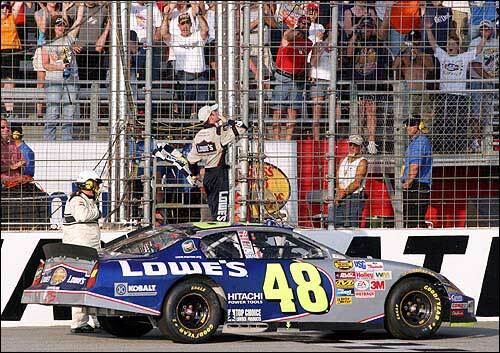 Jimmie Johnson stands on his Lowe's Chevrolet and blows a kiss to a cheering crowd at the finish line after he won the Bass Pro Shops MBNA 500. Johnson won the Nextel Cup race Sunday at Atlanta Motor Speedway in Hampton, Ga. Seven of the 10 championship contenders had major problems, including points leader Kurt Busch. He blew an engine and finished next-to-last, but stayed on top in the points. Johnson jumped two places to second, only 59 points behind. He also became the first driver with three straight victories in a season since teammate Jeff Gordon won four in a row in 1998. Johnson pulled his winning car up to the flagstand, picking up the checkered banner. Then, with it flapping out the driver’s side, he circled the 1.54-mile trioval in reverse, soaking up the cheers of everyone in the crowd — even those wearing the colors of rival drivers such as Dale Earnhardt Jr.
“Typically, I would have been booed,” Johnson said, managing a smile. “There’s a lot of red up there. They don’t like blue. That’s cool. When Johnson finally got to the winner’s circle, he made a quick cell phone call to team owner Rick Hendrick, who’ll be getting the checkered flag. Hendrick asked everyone on the team to wear their hats backward — a tribute to the fashion sense of Hendrick’s son. Ricky Hendrick, who died in the crash, was being groomed to take over the team. Three other family members were killed, along with the team’s general manager and chief engine builder. Rick Hendrick’s brother, John, was the team president. “Rick always yelled at his son for wearing his hat backward,” Johnson said, managing a smile. The final three races should be quite a shootout — Johnson, Gordon, Martin and Earnhardt all are within 98 points of Busch, who only had one driver that close coming into Sunday. Busch was long gone by the time Johnson took the checkered flag. The Ford blew its engine on lap 52, sending it to the garage with smoke billowing. There was no chance of repairing the car. The crew loaded it into the hauler and settled for a next-to-last-place finish, throwing the championship race wide open. But Busch wasn’t the only one having problems. Matt Kenseth, the defending Cup champion, blew an engine and finished 41st, one spot ahead of Busch. Elliott Sadler was 36th after a collision in the pits messed up his steering. Gordon battled an ill-handling car, had to duck into the garage to fix another problem and wound up 34th. That’s not all. Jeremy Mayfield cut a tire in the early going, scraped the wall and had to battle just to finish 26th. Pole-sitter Ryan Newman was leading early when a mistake in the pits forced him to come back in; he wound up two laps down in 17th. Finally, Earnhardt was in position to seize the season lead when he clipped Carl Edwards on the backstretch and slammed into the inside wall with just 15 laps to go. Junior’s heavily damaged car couldn’t finish, leaving him in 33rd for the second week in a row. Martin, a four-time series runner-up, yearns to win a championship before calling it a career. The Roush Racing driver already has announced that 2005 will be his final full season. The 45-year-old Martin probably would have won on this day if not for two late yellow flags. He stayed on the track when Kevin Harvick stalled, while everyone else in the lead pack ducked into the pits for fresh tires. That made the difference for Johnson, whose Chevrolet claimed the lead on lap 310. Everyone came in when Earnhardt crashed, but Johnson already had gained valuable track position on Martin. Johnson reclaimed the lead from Casey Kahne with 10 laps to go and built up enough of a margin to fend off Martin.